Pets have an amazing way of relieving stress and tension, a fact that has been studied and verified by scientists. One of the primary goals of Sunshine Friends, Inc. Therapy Pet Program is to bring joy and happiness to people in the Central New York Community through interaction with gentle, caring animals. When Syracuse University recently held their annual De-Stress Event on campus for students entering exam week, they asked Sunshine Friends to be part of the event. The event looks to provide students with a few hours of relaxing activities during the heart of exam-week. Accommodating the late-night lifestyle of students, the event is held at night, from ten o’clock to midnight and offers free massages, healthy foods and snacks and among other relaxation services, an opportunity to enjoy the company of one of Sunshine Friends Certified Therapy Dogs. 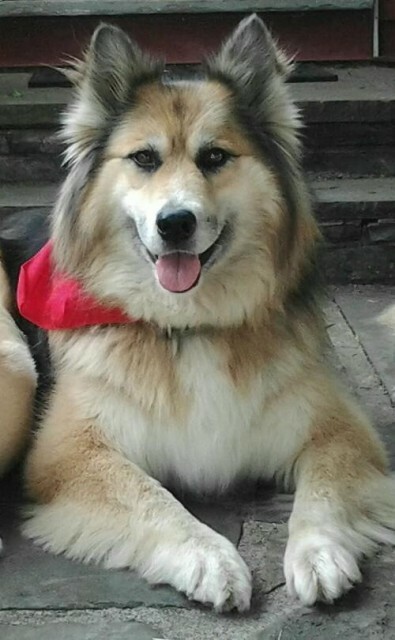 According to Sunshine Friends’ volunteer Melanie Hoover, both the students and her dog Boscoe (a Siberian Huskey/German Shepard/Tibetan Mastiff mix) mutually benefited from the quality time spent at the event. The reaction of the students at the event mirrored the reaction that Sunshine Friends’ volunteers see every time they visit a hospital, nursing home or school with their pets, a smile breaking out on a shy face, a tense demeanor turn to joy, or stress evaporate into thin air, even if only for a little while. needed for an individual or a setting. According to Melanie, ”If someone is quiet, he will quietly sit with them for a moment, like at a nursing home. When he is around younger energetic people, he will ‘sing’ or ‘talk’ to them and do what I call his ‘happy dance’ to get their attention. I am always amazed at how my dog interacts with people – he ‘knows’ what type of interaction is appropriate for the moment, and at almost every visit I take him on I leave the location stunned, amazed, and at awe at my dog’s abilities to do his job as a therapy dog. Certainly Boscoe’s skills were well-received by the students at Syracuse University who left smiling and de-stressed and sharing photos of their time spent with Boscoe on Twitter and Facebook and Instagram. Boscoe seemed to be a little social media celebrity that day! says Melanie. For Boscoe and all the other pet volunteers with Sunshine Friends, there is no such thing as another day of work. Whether they are interacting with students, or children, or seniors, bringing happiness to the lives of the people they meet is never work. It’s the beginning of a new friendship. Something that would make anyone smile.